Diplomatic mission of the UNR – a diplomatic mission, based in London in 1919-21, which represented the government of the Ukrainian People's Republic (UNR). The initial members of the mission, appointed on 28 January 1919, were Mykola Stakhovsky (head of mission), Marian Melenevsky and Jaroslav Olesnitsky (counsellors), L. Bazilewitch and S. Shafarenko (attachés), and six support staff. The mission arrived in London in May 1919. At first it occupied premises at 38 Kensington Mansions, Trebovir Road, London SW5, and in October 1919 moved to 75 Cornwall Gardens, London SW7. The mission was not officially recognised by the British government. It’s main objective was to secure British recognition for the UNR, gain moral support and assistance for Ukraine and establish commercial relations between Ukraine and the UK. The mission also disseminated information and publications about Ukraine. From July 1919 to February 1920 it published a weekly bulletin, The Ukraine. 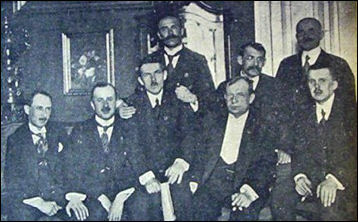 In 1919 the mission initiated the formation of the Samopomich society in Manchester. In February 1920 it provided organisational support for a series of concerts in London by the visiting Ukrainian Republican Capella, a choir established by the UNR government. In September 1919, owing to ill health Mykola Stakhovsky resigned as head of the mission. His duties were temporarily assumed by Jaroslav Olesnitsky until January 1920, when the newly-appointed head of mission, Arnold Margolin, arrived in London. In July 1920 Margolin tendered his resignation, and this was accepted in the following month. He was succeeded as head of mission by Olesnitsky. Other staff of the mission included Mark Wischnitzer, Antin Khlopetskyi, Iryna Dobrodieva and Mykola Horbenko. From mid-1920, with the gradual weakening of the UNR’s position and the consolidation of Soviet rule in Ukraine, it became increasingly difficult for the mission to fulfill its purpose, especially after the UNR government was forced into exile in November 1920. In 1921 Jaroslav Olesnitsky returned to Lviv. In 1923-24 the work of the mission was continued to a degree by Roman Smal-Stocki, an unofficial representative in London of the UNR government in exile. Photo: Members of the London UNR mission: 1 from left - S. Shafarenko, 3 - M. Melenevskyi, 4 - M. Stakhovsky (head), 5 - J. Olesnitsky.